For those of us that can’t get enough of Indian cuisine, sometimes it isn’t sufficient to just to enjoy the odd Friday night takeaway or an evening out at one of London’s best Indian brasseries. Many aficionados of Indian food want to learn to create their own dishes and explore the world of blending spices and exotic ingredients to produce their own Indian feasts. Of course, there are plenty of excellent cookbooks out there; just have a browse through the cookery shelves of your local bookshop or click away through Amazon’s cookbook collection. You’ll be surprised by the sheer number of slick and glossy books promising everything from the A-Z of Indian cookery and classic traditional recipes, to inventive fusion dishes, ideal for the adventurous cook. However, for a truly authentic experience, follow in the footsteps of the culinary tourists – those that are combining their keen interest in Indian food with a holiday. Indian cuisine experiences huge popularity all over the world and is often cited as one of the top two favourites of global cuisine (the other being Chinese), so it’s no wonder that more travellers than ever are choosing to take cooking classes when visiting this captivating country. Keralan food has skyrocketed in popularity over the past decade with its spicy, coconut infused dishes and excellent range of vegetarian and seafood recipes. Haritha Farms offers a range of cooking holiday packages, from Stay and Cook deals where you can attend the odd lesson whilst staying at the farm, to full 10 day programs. You will stay on site in a picturesque cottage right in the midst of the spice gardens. If first impressions count then prepare to be blown away by this stunning, 350 year old house situated in North Goa. Relaxed and informal cooking lessons are run by an experienced local chef with a strong speciality in seafood. There is the choice of staying in Silom House with breakfast included or taking lessons and staying off site. This tour will not only pick you up from your hotel but will take you right into the heart of the action, to the local markets where fresh produce is purchased for the Bengali kitchen. Chefs from the top Bengali restaurants in Kolkata often give informative demonstrations or local housewives might step up to demonstrate their considerable skills. If you have a hankering for fusion food, this might be the cooking school for you. 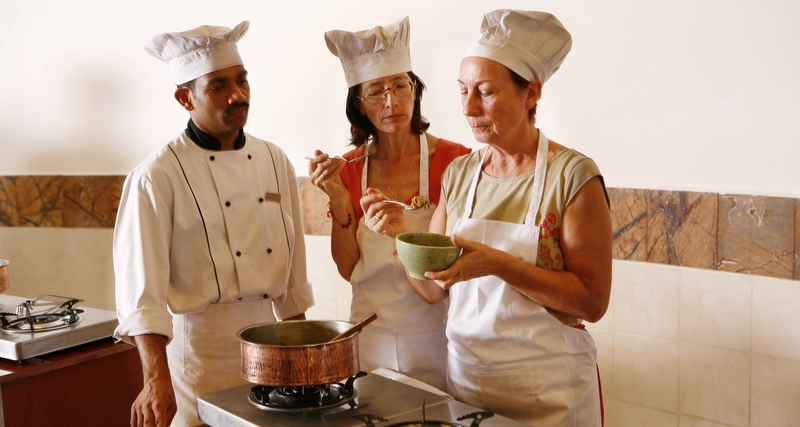 Half day courses are offered in not only the specialities of South India but also in French cuisine due to the French heritage that can still be felt in Pondicherry to this day. The menus that you can choose to explore include traditional vegetarian Tamil food, seafood, a meat-based Tamil festival option; and Keralan food. This could be the best option for families as cooking workshops are also on offer for little ones.